While Arsenal fans have been basking in the euphoria of the Alexandre Lacazette announcement, there is still much work to be done in the team, with more signings expected as well as the important part of sorting out the futures of some of the club’s star players with a year left on their respective contracts. To be honest, it’s rather unfortunate to see how we got to this situation with Mesut Ozil, Alexis Sanchez, Jack Wilshere, Alex Oxlade-Chamberlain, Kieran Gibbs, Wojciech Szczesny and Matt Debuchy all left with only one year left on their contract with the club. There are certainly some players on the aforementioned list that have no futures with the club, while there are others that are regarded as indispensable to the team. Alexis Sanchez certainly falls into the latter category and with 72 goals in 145 appearances for the club, he has risen to talismanic status in the team, especially after hitting the 30-goal mark that was a norm for the likes of goalscoring legends Ian Wright, Thierry Henry and Robin van Persie before him. A player like Sanchez was expected to be in high demand and the wolves came sniffing with Bayern Munich and Manchester City reportedly interested in his services. Will the club play hard ball and allow the lad leave on a Bosman? The ideal scenario would have been to tied Sanchez down with a juicy new contract, but with the Metro reporting that the Chilean hotshot wants an astonishing £400,000-per-week contract to remain with the team, the situation becomes very difficult. Normally, I would take this sort of news with a pinch of salt, as the media always circulate all sorts of bullcrap to sell their content but what if it’s actually true? Why would a £140,000-per-week earner request for such a mammoth sum to hamstring the club? If this is what is really happening, then I hope Arsenal keep him at the club for his final year of his contract, then send him packing at the summer, so that he can find his £400,000 elsewhere. It would some financial sense to take the £50m or whatever from Man City, but the backlash would be terrible from the fans and media alike. 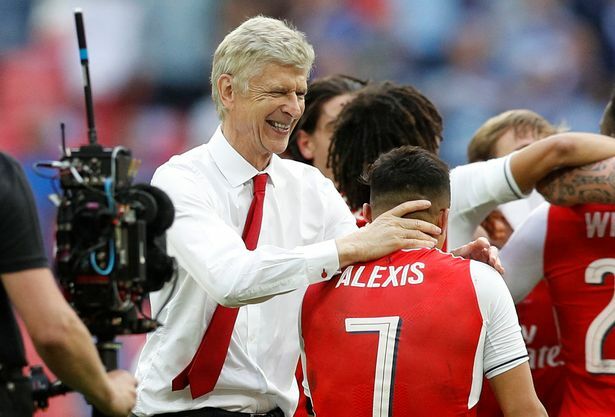 Arsenal is meant to be challenging for the Premier League this season and they stand a better chance of doing it if Sanchez remains with the club. Like Hell, they can follow the Robert Lewandowski route and use him in the final year of his contract before allowing him go to wherever he wants. Alexis doesn’t strike me like the type that would be sulking on the pitch because he wasn’t allowed to leave to Man City. He is a professional and will be expected to do his job, which is play football for Arsenal. I will follow this development closely and see how it pans out. Posted on July 7, 2017, in Arsenal, Football, Premier League, Transfer Gossip and tagged Alexis Sanchez, Arsenal, Football, Premier League. Bookmark the permalink. 5 Comments. Report from metro ? Why do you guys believe this rubbish. Please Wenger sell him and get us another player. It’s not ridiculous if Manchester Dhabi are prepared to pay it though. Did you see what happened to Zlatan? Sanchez deserves whatever Arsenal will pay him, footballers have a short career, billionaires have a long one!! Look where Sanchez came from, he went to bed many nights hungry, thirsty, he’s working to ensure no one else in his family has that experience!!! Stan (the owner is rich through marriage and maybe his business dealings) has made millions off the back of Sanchez, that man should get what he can!!! Man for someone who is from where you’re from its straight embarrassing to see you get on the side of the wealthy!!! That’s why Donald Trump is president here in the US, people in a certain class foolishly supporting the rich!!! Reminds me of the folks during imperialism and they wonder why we are behind!!! Wake up, support the player, he’s on the pitch risking all, what is the owner risking his grandparents money? By the way, where was that money made??? Wake up man!!!! Emancipate yourself from mental slavery!! !